As you know, the last few weeks we have been growing our own plants in store. We have been growing chillies, sweet peppers and aubergines (A random mix we know). We have been using a different potting system and different lights to see whether different products have an effect on the plant's growth rate. For the nutrients we have been using ChemGen Ltd, these are a new range of nutrients that have been getting our customer's amazing results. So we wanted to put them to the test and see whether they could help our plants get bigger and healthier yields. Let's take you on a tour of our Hydroponics Gardens, we currently have 7 grow systems in place so there is a lot of maintenance going on at the moment. Our youngest lads James and Corey have been looking after the plants as part of their daily jobs. Let's start with the Vitopod which you can find at the back of our shop on the countertop. For our seedlings, we have used the Vitopod propagator system. All of the plants that we grow will start here as seeds before moving on to bigger pots. Our seeds are in ½ litre pots in which the soil has already been pre-soaked and the top of the soil gently sprayed, this will help with the germination of the seeds. The soil we have used for the Vitopod is Coco Charge. What is so good about the Vitopod is that it is a heated propagator which allows you to set the optimum temperature for our vegetating plants. They are currently set to 24°c and the humidity is kept at key 70 - 80% using the 8L intelligent humidifier. We are currently hand feeding all our plants so that we can perfectly dial in feeding times and amounts, as this will continuously change as the plants continue to grow. The light used over the Vitopod is the MaxiBright 315W with focus reflector. This is a great light to use as it has a low power output resulting in a low heat output. We have noticed that with this light we have seen a very uniform canopy so far with our saplings. With the Vitopod we are planning on changing the foliar feed each week. First, we used ChemGen A+B but next week we'll be using Clonex mist. We are doing this to test if there is a sudden increase in growth with different products. Next up we have the Green Man system which you will find at the front of our shop in the Mammoth Tent. The Green Man system is a stand-alone pot from Green Air Systems but this can easily be adapted to include more pots, on a flood and drain combi system. This is a DWC (deep water culture) system with a drip irrigation ring. For those who are advanced in gardening, this system will produce explosive rates of growth. We must be observant of this system to make sure that it is feeding properly via the drip ring and bubbler, as hydroponically fed plants cannot deal with a drought for long. Again for this system, we are using the Maxibright 315W CDM to observe if there is any difference between this system and a drip-feed system. In the middle of our shop on the main stage, we have our XL-wide Wilma system. This is a recirculating drip feed system where the water is stored in a solid reservoir below. 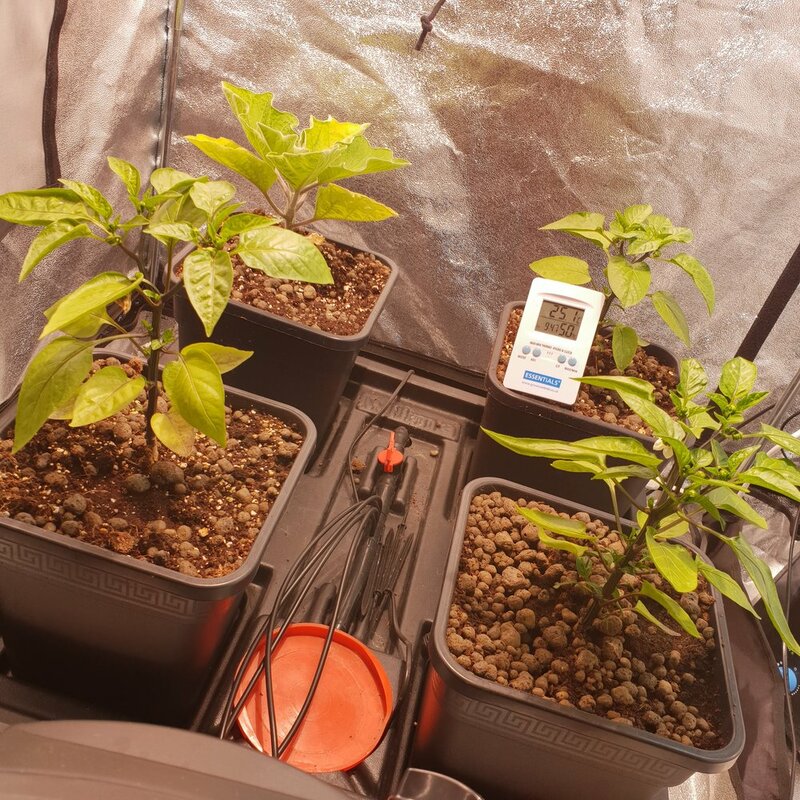 Our apache chillies here are growing in a soil so the system is just using water and being hand fed a nutrient solution 1-2 times per week will prevent any salt and nutrient build up. The Wilma system like the rest of the systems on show is currently being hand fed. This is to allow a good root zone to be established before the system is switched on, this will stop the roots following the flow of the dripper. The light used here is the 4ft 8 tube T5. We have used a low wattage light on these plants because we want to see how this will affects the plant's growth. We may change this later on depending on the health of the plant when it is bigger. At the back of the shop in the Lodge 120 tent, we have an 11L 4 pot Wilma, which is our most known recirculating dripper system. In this system, we have potted all of our plant varieties (2x apache chillies, 1x sweet pepper & 1x Aubergine plant) to see if any plants react better than others with this feeding method. In this tent, we are using a humidifier to help raise the humidity to see if this has a positive effect on the plants compared to ones without. We aim to keep our humidity at 60-70% at all times. The medium used in our pots is the Eco Thrive 60/40 as this will help us not over saturate our pots and aid even drying. We are using the Maxibright 315w CDM with the horizon shade. We have noticed however that the growth is a lot slower than our GreenMan System. As the only changing factor is the systems we can pinpoint that is the feeding method of the systems that are helping the plants growth. In the grow room we have 3 different systems on the go at once. All of the systems in the grow room are using Dimlux 1000W on a maxi controller to ensure that the environment stays within optimum conditions. Our Maxi Controller controls the power output of the light, fan speed, heater and humidifier. All according to heat and humidity. We want to keep the humidity at 60% and the temperature at 26°c. At the minute all plants are being fed on ChemGen A+B. Firstly we have the 1.2 Trojan tent with the 4 pot easy feed system by Alien which is a gravity fed system. The medium used is Ecothrive Charge 60/40. With this system, we have to make sure that Ph, EC and the tank level are regularly checked. The plants in this system are hand fed currently with ChemGen A+B. This will carry on for a few more weeks until the roots are bigger and are able to search for food on their own. Next, we have the AutoPot system which is being used with fabric pots. This system also uses the gravity fed method which helps the roots search downwards for the nutrients. We have used 60/40 coco/pebbles, this will help to promote an even wet/dry cycle and helps the roots uptake what they want. This system is one of the easier ones to maintain, all we need to do currently is ensure Ph, EC and water levels are at the right level. Again like all the other systems, they are currently being hand fed with ChemGen A+B. 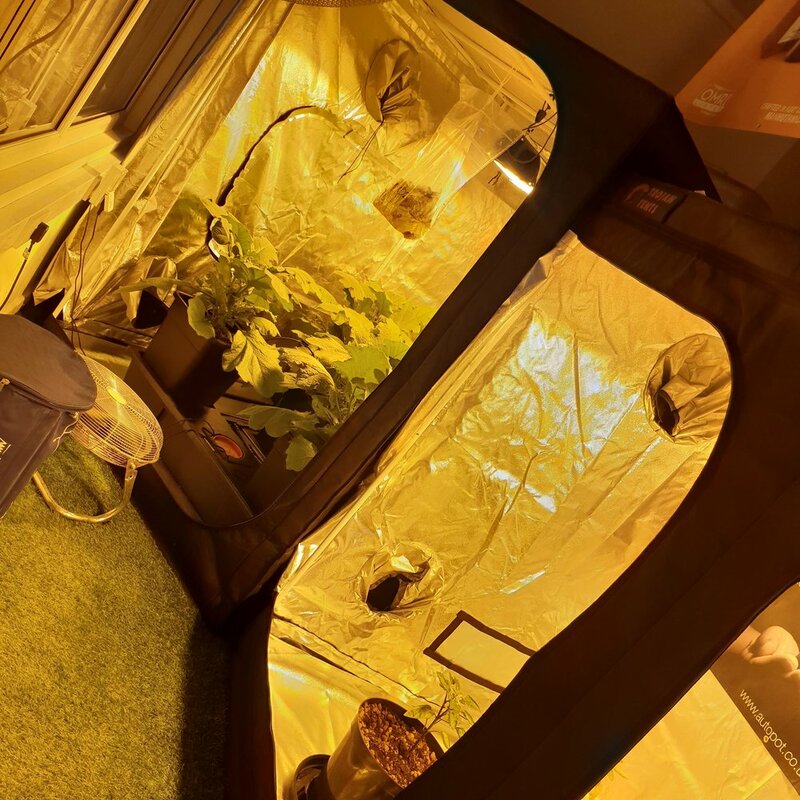 Our final system is in the 1.5 trojan Tent, it is a 5 pot Wilma system which again is a re-circulating drip-feed system like our previous Wilma Systems throughout this blog. This Wilma contains our Aubergines and is currently being hand fed. Above this system we have a My Co2 bag which releases Co2 into the air, this bag will last for up to 6 months. Increasing the Co2 in your grow room can help your plant grow stronger and faster with up to a 30% - 50% rise in yields, bear in mind all other growing conditions must be at their optimal levels. After going through all our plants and our systems it is hard to say yet which one has gained us the best results as it is early days. However, we can say that so far in terms of growth the Green Man system. We will continue to monitor our plant's progress in order to decide what the best growing conditions and products are. 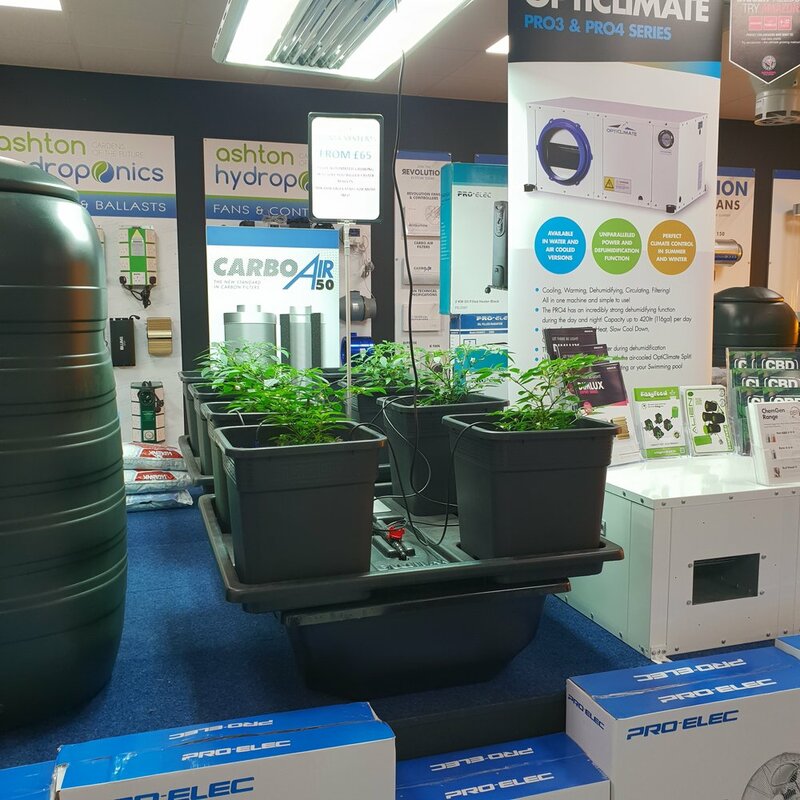 If you would like to learn more about the products used please email info@ashton-hydroponics.co.uk or call us on 0161 339 1673.